Unmistakably one of the best musicians of her generation! Award-winning vocalist and pianist Norah Jones is one of the most sensational artists of our time, and her unique blend of jazz and pop, and trademark sultry vocals appeal to audiences from a variety of genres. Norah Jones is one of the most popular contemporary jazz and jazz-influenced singers of our time. Her debut album Come Away With Me was released in 2002 and sold 22 million copies worldwide. The release of her 2016 album, Day Breaks, proved that Norah Jones still has a remarkable talent and his firmly rooted in jazz. Don't miss her this year when she embarks on a brand new North American tour, surely a sign that new music is yet to come. Continuing to prove herself as this era's quintessential artist. Her unmistakable unique sound is something that can't be missed! Sound good to you? 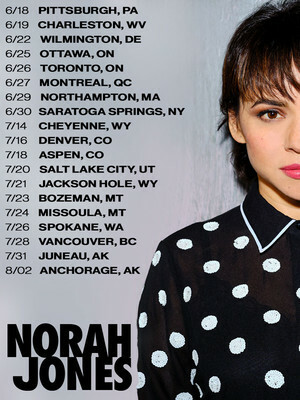 Share this page on social media and let your friends know about Norah Jones at Heinz Hall. Please note: The term Heinz Hall and/or Norah Jones as well as all associated graphics, logos, and/or other trademarks, tradenames or copyrights are the property of the Heinz Hall and/or Norah Jones and are used herein for factual descriptive purposes only. We are in no way associated with or authorized by the Heinz Hall and/or Norah Jones and neither that entity nor any of its affiliates have licensed or endorsed us to sell tickets, goods and or services in conjunction with their events.